Washington Lodge History - Washington Lodge #17 Hamilton Ohio! ​In 1886, the lodge agreed to lease the third floor of a new building to be erected at High and Riley Streets. They leased space in this building until land was purchased on March 5, 1926, for the erection of a new temple at High between Seventh and Eighth Streets. The first meeting in the new building was held November 27, 1928. 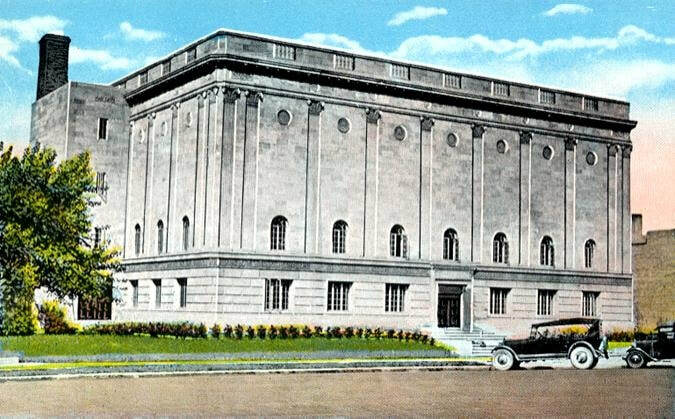 Pictured: Hamilton Masonic Temple as designed in 1928. The story of the Masonic Fraternity in Hamilton is one of growth and progress, from the very beginning. With one small lodge, at the outset, and a roster of but seven members, the movement gained momentum as the years went by, strengthened by the addition, at rather long intervals, of three York Rite Bodies, and, after a long lapse of time, by two additional lodges of Free and Accepted Masons. Chapters of Eastern Star came into being, as a matter of course, as well as the other organizations which are associated with the Masonic Fraternity throughout the nation. By the year 1811 the village of Hamilton had grown until its inhabitants numbered more than two hundred and fifty souls, and it is not at all surprising that among that number were men who had affiliated with the Masonic Fraternity in the eastern towns from which they had migrated. Seven of these men, all well-known and respected in the community, petitioned the Grand Lodge of Ohio, itself but three years old, for a dispensation to found a lodge here. The seven were Mathew Hueston, Joseph Potter, William Wallace, Robert Taylor, Thomas Blair, Alexander Sackett, and Joseph Hough, all Free and Accepted Masons, as their petition averred. Their prayer was granted, and the Dispensation issued at Chillicothe under date of September 7, 1811: signed by the famous Lewis Cass, as Grand Master, and attested by Henry Brash, Grand Secretary. The document reached Hamilton the evening of October 10, 1811, by a devious route, the final stage being from Cincinnati by the hands of five Masons of that city, who were assigned to institute the new lodge here. The first meeting instituting the lodge, was held that same evening, in the Murray Tavern at the west end of Dayton Street, with twelve Masons present, Bro. Daniel Symmes, of Cincinnati, acted as secretary, and wrote the first minutes. On November 18 they conferred the F.C. Degree on the Treasurer of the Lodge, Brother John Taylor. They also voted to pay the sum of $8.00 to Jacob Burnet, Deputy Grand Master, which amount was full payment of the fee for the dispensation under which they were working. On Dec. 2 came the first lodge election. Three were nominated for the office of Worshipful Master: namely Thomas Blair, Samuel Bayless, and Joseph Hough, the incumbent. All three withdrew from the room, and when they were called back again learned that Blair had been elected. A similar procedure was followed for the election of all the remaining officers. Following, St. John’s Day, December 27, was set for installation, with Brother Potter being instructed to invite the brethren from Cincinnati to attend. There were two St. John’s Days of course, June 24 and December 27. Officers were elected then for only six months. They met, as appointed, Friday, December 27, at 3:00 p.m., and installed their officers, after which they voted the Worshipful Master authority to represent the lodge at Grand Lodge, or to send his proxy. And they mentioned that refreshments were served. That is the first time they wrote that. Since that time the practice has become un8versal with Masonic lodges. Probably it was before that, too. October 5, 1821, the lodge moved its meeting place in the house of Thomas Blair, a tavern at the southwest corner of what is now Second and Court Streets. It was there that they were meeting when they received their charter in 1813. Grand Lodge at that time was meeting in January, and the charter had been voted in January of 1812, but due to the disruption of activity in general because of the Indian troubles north of here, the new document was not issued on time, and was brought back by the local Worshipful Master from Grand Lodge Convocation of January, 1813. The number seventeen had been assigned to the lodge. By March 7, 1814, we find the lodge evidently doing well financially, for Brothers Hough, Este, and Millikin were appointed to inquire into their finances and determine “whether it be expedient to lay the same out in the bank stock”, probably meaning depositing in the local bank. At the April 14 meeting the committee reported it not “expedient”, but they do not tell us whether they reached that decision because the cash o hand was too scanty to be banked, or whether it was because they knew the banker. Some of those early banks in the area, believe me, seem to have been operated on the proverbial shoestring. Some of the local member went north with the troops during 1813 and 1814, but the lodge continued to make progress, although changing its meeting place a time or two. On Aug. 5, 1816, we find them purchasing furniture, at a cost of $17.31 ¼ . Twenty-two members were present, which by now was just about an average attendance. We also find that they had begun to follow more closely the procedures that we follow today, although it was 1820 before Grand Lodge established its general code. The new building completed, and the moving done, by August 3, 1818, they now begin with “Washington Lodge Rom” instead of merely “lodge room”, as they had been writing it. August 2, 1819, Brother Thomas Corwin made the first of his many visits to Washington Lodge, his brother Jesse having dimited here, moving from the town of Lebanon, where Thomas remained. Thomas Corwin was a famous man in his day, as you will remember from your history books, he was governor of Ohio, a congressman, and later a member of the cabinet in Washington. In 1828 he was Grand Master of Masons in Ohio. On September 19, 1824, with many present, they held funeral rites for a past-master, “Brother Thomas C. Kelsey Esq., 36 years of age, of Rossville,” and recently deceased. The remains were buried in Hamilton, they tell us. Crepe was to be worn on right arms for thirty days. It seems that sometimes they wore the mourning band on the right arm and sometimes on the left. We should probably mention that the Rossville Cemetery was at the location of our present First Ward park, and the Hamilton Cemetery was at the site of our present Fourth Ward park, on South Third Street. In the late 1840’s they started burying in Greenwood, having moved the bodies which had been buried in the two older graveyards. At the Installation Meeting Dec. 27, 1825, the lodge voted that its steward be allowed twenty-five cents for every meeting he performed his duties, and that he be exempt from the payment of dues. Brother Brooks was elected Grand Lodge Representative, and his stage fare to Columbus allowed by the lodge. Brother Samuel Millikin was to purchase a shovel, tongs, andirons, and tinder, at a cost of $3.84. May 1, 1826, William B. Van Hook was given the job of repairing the lodge room, laying new flooring, and interior painting, on his bid of $85.81 ¼ . Close figuring, it seems to us. September 12, 1826, is the day when the “Morgan Trouble” is supposed to have begun, in New York State. Writers tell us that this had a deleterious effect upon Masonry for almost the next ten years. So I was particularly careful to study our minutes for this period very intently, and found absolutely nothing to indicate anything like “Morgan Trouble.” Certainly there wasn’t here in Hamilton. It was even reported that out lodge hall here was broken into and “valuable jewels, and a minute book stolen.” WE have the minute book. I have read it. On the fly leaf is the note: “This book was mislaid, but has since been found.” The jewels, as you know, were not gems at all, but merely flat pieces of stamped metal, of no intrinsic value. Our records show these had been loaned to another lodge a time or two, and this was probably one of the instances. No, bretheren, that ten year “Morgan Period” had no effect on our lodge whatsoever. They never missed a meeting, held their processions and parades regularly, and received petitions for membership without let-up. Any Mason who doubts my word for this, let him come with me and I will show him our minutes for those ten years. The word “Morgan” is conspicuous by its absence, and loge went along exactly like it had before, and as it did afterwards. It is interesting to note that it was during that ten year period that Andrew Jackson was elected president of the United States: once in 1828 and once in 1832. And Andrew Jackson was not only an ardent Mason, but was actually past Grand Master of the Grand Lodge of Tennessee. September 16, 1826, the lodge pad $4.00 to John Spencer, son of Brother Andrew Spencer, for the “subscription to a school.’ On November 6 they spent $23.75 for medicine and attendance on a Brother, during a “spell of sickness.” January 27, 1827, they record among the visitors one Brother Christian Holmes, a name well-known in this area today. Dec. 3, 1827, they pad for clothing for the young son of a deceased member. And later they paid a bill for the same boy, for board and lodging. March 7, 1831, the lodge room having become outgrown, they closed a contract with James McBride to rent the fourth story of his new Hamilton Hotel, at Second and high Streets. He must have wanted them as tenants very much for he gave them a twenty-year lease for $18.00 per years. Also, this is the first time the new word “hotel’ appears in our records. The lodge spent $205.00 to furnish the new room, and voted to rent out the old room as soon as the move was completed. Then they voted to celebrate the festival of St. John the Baptist, and to invite the other Masonic lodges in this area to participate. June 4, 1832, and they are invited to celebrate the approaching St. John’s Day in Cincinnati, “in the character of a lodge, under the auspices of the Grand Lodge of Ohio.’ Washington Lodge had arrived. It never rains but it pours, and they also received an invitation from Eaton Lodge to go there the same day, June 21. Naturally they tell us they informed the Eaton Brethren of the previous engagement, and thanked them. Oct. 1, 1832, they spent $40.36 for repairing the roof of the old lodge room at Third and Dayton Street, which they still owned, of course, April 7, 1834, and we note they were invited to visit with St. John’s Lodge, in Dayton. April 9, 1834, they opened, and formed a procession to the “Presbyterian Church in Rossville,” to the funeral of Brother William Booth. Reverend Brother Elliott gave the sermon, and they collected $7.50 and gave it as a present to Reverend Elliott. They expressed thanks to the Hamilton and Rossville Harmonic Society for their services. June 4, 1834, they discussed buying the lot at Third and Dayton. On July 7, 1834, they read a letter received from LaFayette Lodge, of Cincinnati, regarding a great meeting being arranged due to the recent death of General LaFayette, a Mason. They replied that a number from here would be present. June 24, 1835, and they marched to the Court House Yard, where they heard an address by Reverend Brother A. W. Elliott. November 7, evidently influenced by the condition of the roads in the rural areas, they voted to exempt from dues all members who lived out in the country, expect when they attended lodge. Dues were 25¢ per month. In the early years of masonry in Ohio, traveling to Grand Lodge Convocations presented a big problem because of the extreme scarcity of roads around the state. For instance, when Grand Lodge, in 1837, changed its time and place of meeting from Columbus, in January, to Lancaster, in June, there was, for that one year, a failing off in attendance at the convocation. Even to this day there is no direct road between Hamilton and Lancaster, and in 1837 those high hills along the Little Miami, such as the Fort Ancient descent and ascent, would have presented an impassable barrier. That is, if there had been any roads that way, which there weren’t. At times of the year when the few roads were passable, a stage coach trip from here to Cincinnati required a day, and from here to Dayton was a long day’s journey. Little wonder, then, that the first year Grand Lodge met in the fine town of Lancaster, lodges around here did not send their usual representatives. Folks who lived ten miles from town in those days could only depend upon getting in during dry spells in the summer. If the fall was rainy they had to wait for the January freeze to bring their products into town, or to pick up supplies there. The changes to the last week of June for the Grand Lodge sessions was a drastic one, too. For June 24 was the great festival day of Masonic Lodges in those times. “The anniversary of our illustrious brother St. John the Baptist,” the secretary of Washington Lodge No. 17 called it in his minutes. On that day each year it was the custom for lodges to gather in one town in an area, by previous arrangement, there to hold a great procession, with a dinner, and speeches, often in a court house yard. The host lodge in that year of 1837 was Jefferson Lodge No. 90, of Middletown, which had sent out its invitations at an earlier date, in preparation. There St. John’s Day gatherings were great affairs. Small wonder then that Washington Lodge voted to go to Middletown. There would be many old friends to greet there from surrounding lodges, and a good time would be had by all. Washington Lodge had been faithful in attendance at Grand Lodge. It was the custom in those early days to elect a member to represent each lodge at Grand Lodge, at the meeting when the officers of the lodge were elected. They had elected Brother John H. Dubbs to represent them at Columbus, January 5, 1835, and Grand Lodge records show he was present. They elected Brother William B. Van Hook to go to the convocation of January 4, 1836, and he was there also. Then at the meeting here December 5, 1836, evidently in the belief Grand Lodge was to continue to meet in January, they elected Brother Samuel Bayless to go. But Grand Lodge did not meet at Columbus in January, 1837. Pursuant to a motion adopted just before the close of the 1836 Convocation they had agreed to meet at Lancaster instead, and in June. It is entirely possible that some of the subordinate lodges were not informed of the change. Any delegate who had left the final 1836 session a few minutes early to meet a stage coach schedule, would have missed the motion. But Washington Lodge learned of it before June, 1837, for we find in its minutes of June 5, 1837, that they elected Brother James B. Cameron to go to Grand Lodge, to open at Lancaster, June 22. And they voted to pay his traveling expenses, as was customary. Why does he not seem to have gone is not revealed. Counting a week there, and adding time going and coming, it would have required almost three weeks in all. Travel would have been by a round-about route, via stagecoach, through deep mud if it rained, and heavy dust if it didn’t. Anyway, we know that the following year they made it, for Grand Lodge records show that seem to have gone is not revealed. Counting a week there, and adding time going and coming, it would have required almost three weeks in all. Travel would have been by a round-about route, via stagecoach, through deep mud if it rained, and heavy dust if it didn’t. anyway, we know that the following year they made it, for Grand Lodge records show that the delegate, Thomas Kennard, was present at the June, 1838 meeting in Lancaster. Some years ago, this writer spent his spare time one summer reading all the minutes of Washington Lodge No. 17, from its first meeting October 10, 1811, down to the present era. The lodge has continued active, month after month, and year after year, from its beginning. The year 1837 was no exception. It was about an average year. Petitions came in, initiatory work went on, and they continued to hold their pro-procession to the grave-yard whenever a brother passed on; wearing their crepes on left arms for thirty days as a sign of their mourning. Probably the highlight here of the year of 1837 was the visit of the Grand Lecturer fo Grand Lodge, Brother Barney, who came here by invitation September 28, and held meetings for three days. And he was introduced to the Lodge strangely enough, by the Brother Cameron who was supposed to have met him the previous June, over at Lancaster. At the next stated meeting they voted Brother Barney $25.00, and also paid his bill at the famous Blair House here: Brother Tom Blair, you will recall, was a past master of the lodge. In 1838 the newly formed Hamilton Chapter, Royal Arch Masons, received it Charter, and was assigned the number 21. The Chapter, of course, continued to meet in the same room the lodge was using. By now the lodge was going ahead with plans to acquire the lot at Third and Dayton and to building their own new building there. Getting a clear title required some time, and not little effort, and the new building was finally begun in 1844. It was in that building that Hamilton Council R. & S. M. and Hamilton Commandery, Knight Templar were later formed and held their meetings. October 19, Brother James Reily was here from Texas, and addressed the lodge on Masonry, especially its progress in Texas, which at that time was most definitely pioneer territory. This Brother Reily seemed to be particularly well-known to the brethren from Oxford. In 1844 we note that our lodge had begun electing officers annually. February 3, 1849, the lodge voted to pay the School District No. 1 of Hamilton the tuition for the children of their deceased Brother Fenton, recently killed in the Mexican War. The lodge met on June 9, 1849, and the secretary, Brother Levi Richmond, finished writing his minutes about the middle of the page on the left hand side. Then below this he made a note, dated June 16, 1849, as follows: “Weather quire warm and unhealthy. The Asiatic Cholera is now raging in Cincinnati and rearly all large towns in the USA.” Then on the right hand page he proceeded to write the minutes of that meeting of June 16. That was all. On the next page the minutes of that meeting were written by the hand of another person. Bro. Richmond had died of the cholera. Soon afterwards Brother Jacob Gephart and Brother E. Green also succumbed. The lodge could not have a regular funeral service, for bans had been issued against any kind of meetings during those months the cholera was epidemic. However, the members were to attend, insofar as they could within the terms of the ordinance. They wore the usual badge of mourning. Bro. Richmond was a general in the Ohio Militia. On March 3, 1850, they set down the size of the plot of land they owned, as eighty feet by one hundred feet. Jan 17, 1852, Brother Wm. Huber died, and they held services. They were now burying in Greenwood. They announce that for this time white gloves were not to be worn, neither were the members to wear the crepe on their arms as they had previously, when a brother passed on. June 18, 1852, they bought two gallons of lard oil at ninety cents per gallon, and one dozen lamp wicks and one lamp chimney, for a total of thirty-five cents. Modern lighting was expensive. Local Masons were making plans for Hamilton Council No. 19, R. & S.M., which was instituted and charged in1853. July 2, 1855, and Brother A. H. DeArmond returned from Oregon, where he had gone with the great movement of people over the Oregon Trail. He evidently preferred Hamilton, Ohio, after all. Dec. 3, they again elected Bro. Robertson master, and considered lighting the loge hall with gas. WE note also that the lodge continues very charitable to the less fortunate. Feb. 4, 1856, they record that they had obtained title to the entire one hundred and fifty feet fronting on Third Street, from the Ludlow heirs. They authorized, too, the gas company to install gas fixtures in their building, for $71.95, the lodge to pay half, and Chapter and Council to pay half. Then they authorized a committee do sell the lard oil lamps after the new gas lights were installed. Dec. 3, 1856, they bought 100 “Odes” for the use of the lodge, one of which “Odes” is still extant, inserted in the minute book. July 6, 1857, and they leased the first floor of their building to Nathan Furman, for a school. Jan. 28, 1858, they report the decease of Reverend Bro. Arthur W. Elliott. The resolution on his death tells us that he was born in Baltimore in 1784, and moved to Hamilton in 1804. He was Grand Chaplain of the Grand Lodge of Ohio for many years, and was the first or one of the first candidates of Hamilton Chapter in 1838. He was a Methodist preacher for fifty years, and a Mason for almost as long. The lodge room and its furniture were to be clad in mourning. June 7, 1858, and they were considering adding a third story to their building. July 5, and we note that the lodge is buying coffee, tea, and sugar for their lunches. They were invited to attend the corner-stone laying of the new Temple at Lebanon, to take place July 4, 1859. Jan. 17, 1861, they wrote a very elaborate resolution upon the death of Bro. (Captain) Joel Collins, the last survivor of the Masons who helped to found Washington Lodge No. 17, F. & A.M. In this resolution we find mention of the others, and they give us titles of some of them, indicating their vocations: Doctor Thomas Ramsey, Colonel Joseph otter, Doctor Alexander Sackett, Judge Robert Taylor, and Doctor Jacob Lewis. Them there were Joseph Hough, Merchant; Thomas Blair, Merchant; and inn-keeper; Mathew Hueston, who built many of the early mills in this area; and Daniel Symmes, who was a member of the first Supreme Court of Ohio, appointed to fill a vacancy during the court’s first term. Brothers Taylor, Lewis, and Collins were not actually present at our lodge’s first meeting, but the resolution tells us they helped to form the lodge nevertheless. A clipping from the Hamilton Telegraph is pasted in. it tells, among other things, that Bro. Collins was secretary of Miami University for thirty years. He was born in Kentucky, and came first to this county in 1791 with St. Clair’s army. He was in Ohio Legislature for ten years, and was a judge for ten years. He died Nov. 14, 1860, aged ninety years. From the dates, I question whether he was actually born in Kentucky, and I am inclined to believe he was taken there as a child. Oct. 23, 1861, the 50th Ohio Volunteer Regiment was stationed here, evidently being formed from this area. The colonel, Michael C. Ryan, was a member of Washington Lodge. He died Oct. 23, 1861, here in Hamilton, cause not recorded. The lodge held funeral services for the late colonel, forming their usual procession to Greenwood, and escorted by the entire regiment of soldiers. Bro. Ryan had been a newspaper publisher here, earlier. April 1, 1862, the body of deceased Brother John Hull was returned here from Nashville, where he had been killed fighting in the Union Army. He was the first member of Washington Lodge killed in that conflict. The funeral was at the Presbyterian Church, and the lodge held its usual procession to Greenwood, wearing white gloves, and with their aprons newly laundered, they tell us. Jan. 13, 1863, they mention that there was a fence around their building at Third and Dayton, a front gate, and nice shade trees. In the back of the building there was a woodshed, and the toilet facilities common to the period. Between the building and the city’s fire engine house just to the south, they tell us there was a vacant plot, upon which they were considering building an addition. Sept. 3, 1868, the Hamilton School Board desiring to take over the school previously operated by Mr. Starr, and to run it as one of the “Union Schools,” the lodge leased the rooms to them, downstairs, for $125.00 per year. Also, at about this time the lodge sent a contribution to Western Star Lodge No. 110, Guyandotte, West Virginia, and one to Mackey Lodge, No. 120, of Care Springs, Georgia, both in answer to requests for assistance in rebuilding their temples, ravished by war. Feb. 13, 1868, the lodge approved the request of eight brethren to start another lodge here, to be known as Hamilton Lodge. It was afterwards assigned the No. 409, and met in the lodge room of Washington Lodge. Sometime later the new lodge began working in the German language. When the two towns of Hamilton and Rossville joined together in 1854, the first mayor was Brother Hargitt. Nov. 20, 1868, he was killed by a train near Cincinnati. A special train brought the body to Hamilton, and our lodge held services. Nov. 6, 1876, and they vote to arrange with Hamilton Lodge No. 409, and Hamilton Chapter and Council, to have the “entire Masonic Fraternity of Hamilton” to hold a parade next June, and to follow with “an old time basket picnic” at the Fairgrounds. They are also inviting the other lodges in the area to participate. June 4, 1877, and we notice there are fifty-five members present, besides the officers. Not bad for a small lodge. And they send a contribution to the fund of the Grand Master of Ohio for the relief of Yellow Fever sufferers in the South. Thursday, October 29, 1885, at 10:00 A.M., Washington Lodge NO. 17, F.&A>M., laid the cornerstone of the new Butler County Court House. Brother John K. Aydeiotte presided. In the year 1896 our York Rite Brethren of that day formed and instituted Hamilton Commandery No. 41, Knights Templar. Jan. 4, 1886, the property trustees announced the receipt of a proposition from Bro. E.G. 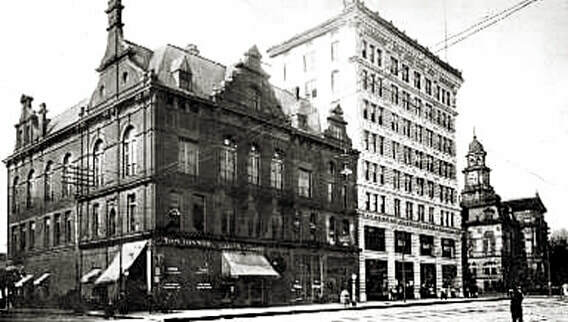 Rathbone, and the L. D. Campbell heirs, to lease to the lodge the third story of a new building about to be erected at the southwest corner of High and Riley Streets, for ten years, at an annual rental of $600.00 the lodge noted to accept, and the vote was recorded as unanimous. Feb. 1, they reported they signed the lease, with Mrs. Campbell. May 3, 1886, they appointed a committee to sell their real estate at Third and Dayton Streets, possession to be given when the “Campbell Building” was ready for occupancy. March 7, 1887, and Brother J. E. Morey, acting on behalf of the Universalist Church, offered them $6,000.00 for the 80 x100 feet nearest the corner of Third and Dayton, the part of the land on which the hall was located. They voted to accept. June 15, 1887, with Grand Lodge officers present, and Grand Master, M.W. Bro. S. Hacker Williams in the chair, they opened a meeting in the old hall, paraded to the new “Reily Block,” as they now called it, and the new quarters were dedicated. They then returned to the old hall to close the meeting, and the records of the July, 1887, Stated Meeting, begin with “Masonic Temple, at new Riley Block,” indicating the move had been completed. The building as on the site of the present Second National Bank. December 27, 1886, and the members of the Hamilton Lodge NO. 409 decided ot surrender their charter, and the members affiliated with Washington Lodge, the town being hardly big enough yet for two Masonic Lodges. We have the lodge’s minute book. Oct. 1, 1888, they contributed to the Grand Master’s Relief Fund for Yellow Fever sufferers in Florida, and July 1, 1899, they again gave to a like cause, the relief fund of the Grand Master of Pennsylvania for the relief of victims of the Johnstown Flood. In their records of the Gay Nineties, we begin to see occasionally the name of one or the other of those we knew only a few years ago as our fine old Fifty Year Masons. Some were member for almost sixty years. Thus we are brought to the realiza5tion of the fact that we are no longer exploring into the deep past of local Masonry, but have arrived at a period where the lodge begins to go along almost exactly as it does today. For the remainder of our narrative, therefore, we will confine our revelations to a few of the things all of us have heard about, and many of those now living remember. In 1904 Washington Chapter, No. 195, Order of Eastern Star, was organized, and received its Charter, taking its place among the “regulars” meeting in the Temple. In the year 1913 came the terrible flood in the Miami Valley, leaving death and destruction in its wake. Washington Lodge and its associated bodies, located as they were in the Third Floor of a large brick building, sustained no loss as a fraternity. Not so with the individual members, and with so many other citizens in the community. The Grand Master of Ohio Masons appointed committees to dispense funds in the valley to relieve the distress. The local committee was made up of Brothers Nelson Williams, Allen Andres, W. P. Cope, Harry S. Wonnell, and E. G. Ruder. In the year 1920, with W. Brother Hugh L. Bates as worshipful master, local Msonry was saddened by the death of the Senior Warden, the genial Mathew Gantz, better know, the resolution informs us, as “Matty.” The resolution upon his passing very beautiful in its entirety, is signed by Brothers John Crocker, Eugene Welborn, and Jacob Lipphardt. Those three brethren, all now deceased, are very well remembered by many of us today. Again we are reminded that our story has brought us upon to the present era. In the minutes of Feb. 5, 1923, we find most important business. The lodge was called upon to pass on the petition of a long list of Brethren, applying for dispensation to form a Masonic Lodge, in the city of Hamilton, to be known as Fort Hamilton Lodge. The list contained the names of one hundred and eighty-seven Masons, more than half of whom were members of Washington Lodge, the remaining being members of sixty lodges, in seventeen states. Following the necessary procedure, it laid over until the next stated meeting. March 5, when needless to say, Washington Lodge most heartily voted is approval. The growth of the fraternity locally had made the advent of a second lodge a pressing necessity. The new lodge, was chartered in October, 1923, as Fort Hamilton Lodge, No. 686. A few years later, following the untimely death of its fist master, W. Bro. Bates, the name of the dodge was changed to Hugh L. Bates Lodge in honor of the man who was one of the outstanding Masons in the long history of the fraternity in Hamilton. In the minutes of Washington Lodge for Feb. 1, 1926, we find that the Temple Board had proposed for consideration a site on south Third Street, upon which to build the new Temple which was contemplated. However, the next month, on March 5, 1926, they brought to the lodge another site, the one upon which our present Temple is situated, High Street, the north side, between Seventh and Eighth Streets. This site was promptly approved by Washington Lodge, as well as by all the other local Masonic Bodies. The land was purchased, a financial campaign conducted among local Masons and Eastern Stars, and the beautiful Hamilton Masonic Temple was built. In the minutes of October Stated Meting, 1927, we see that October 23 was set as the date for laying the cornerstone of the new edifice. Beautiful and tasteful invitations were mailed to the other Masonic Lodges in the area, a copy of which is in our records. The great day came, and M.W. Bro. Nelson Williams, P.G.M., laid the cornerstone with impressive ceremonies. A large crowd was in attendance. The weather was beautiful. Everything, in fact, indicated the birth future which the Temple and Fraternity have enjoyed for the years which have intervened. November 26, 1928, Washington Lodge No. 17 and Fort Hamilton Lodge No. 686 held a joint meeting in the new Temple. A staff of Grand Lodge officers, headed by M.W. Bro. Nelson Williams, proceeded to dedicate the lodge rooms to the service of local Masonry. The next evening, Washington Lodge held the first regular meeting in the Temple, with its annual convocation for the election of officers and the memorial service. It is only fitting that at this point we recall that Bro. Nelson Williams was Worshipful Master of our lodge, and also presiding officer of our three local York Rite Bodies. He became Grand Master of Masons in Ohio, and also presiding officer of all three of the Grand York Rite Bodies of Ohio. Then he went on to become General Grand Master of the General Grand Council, R&SM, of the U.S. Probably no other Mason ever held more honors from the Fraternity than did M.W. Bro. Nelson Williams. M.W. Bro. Allen Andrews, another of our past masters, was Grand Master of Oho Masons, and an outstanding member of the fraternity for many years. In more recent years other Past Masters of our lodge have received honors at the hands of the Fraternity. During World War II, R.W. Bro. Norman C. Steiger served our Second Masonic District as District Deputy Grand Master, and later took the lead in forming Benjamin Franklin Lodge NO. 719, F.& A.M. Later, W. Bro. Robert J. Brown receive the Honorary Thirty-third Degree, and afterwards served as Worthy Grand Patron of the Eastern Star of Ohio. At this w4rititn he holds the office of Secretary of the Scottish Rite, Valley of Cincinnati. W. Bro. Cecil J. Pierce served as Grand Commander, of the Grand Commandery, Knights Templar, of Ohio R. W. Bro. William B. Lakeman served for three years as District Deputy Grand Master, and has been active on Grand Loge Committees. R.W. Bro. Paul J. Crawford holds the Honorary Thirty-Third Degree, and has also served as our District Deputy Grand Master. W. Bro. Michael J. Wuest and Floyd A. Brown also hold the honorary thirty-third degree. Oct. 10, 1911 was the centennial of our lodge, and the brethren met and marched to the First Methodist Church for a Sunday afternoon service. Oct. 10, 1936, our one hundred and twenty-fifth anniversary, the lodge celebrated the even by presenting a pageant, on the Red Room stage, re-enacting the first meeting of Oct. 10, 1811, members of the lodge talking in various parts. The affair was well received by a large and enthusiastic audience. Twenty-five years later, in 1961, Washington Lodge held two meetings to mark its Sesqui-Centennial. There as a Vesper Service at the Front Street Presbyterian Church, Sunday, Sept. 24. The music was provided by the Cincinnati Scottish Rite Choir, and a large number of Masons, and their families, were in attendance. On Sept. 27, following a dinner served in both the Temple Auditorium and the Green Room, to both our own members and many visiting Masons, the lodge again presented a pageant, this time depicting the meeting at which our lodge received its Charter in 1813. With the members of the three local doges present, the affair was held in the Red Room of the Temple, where special scenery had been prepared for the stage, and chairs set up covering the entire floor of the Red Room. Threes, together with every regular set in the room, were filled to capacity, making this the largest tiled meeting ever held in the Hamilton Masonic Temple. Both pageants, the one for 1936 and the one for 1961, were written and directed by W. Bro. William E. Lakeman, who was also Editor of our “Temple News’ from its inception in 1948, and for seventeen years following. October 6, 1947, a petition was receive in both Washington Lodge NO. 17 and Hugh L. Bates Lodge No. 686, asking their approval of the application of a number of brethren to form another lodge here in Hamilton, to be known as Benjamin Franklin Lodge. One hundred and fifty-four names were upon the roll, thirty-four of whom were from Washington Lodge and fifty-five from Hugh L. Bates Lodge. The remaining sixty-five were from any lodges in various states. Both the lodges approved the petitions, and dispensation soon followed. The charter was issued October, 1948, and the number 719 assigned. Thus, from the meeting of twelve men, on that long ago October evening, in 1811, in the “House of William Murray” down where Dayton Street meets the river, has grown three Masonic Lodges, a Chapter of Royal Arch Masons, a Council of Royal and Select Masters, and a Commandrey of Knights Templar. And there is our Washington Chapter No. 195, Order of Eastern Star, which formed in addition, a sister chapter in 1956, designated Fort Hamilton Chapter No. 568, O.E.S. and besides these, there are the number of fine organizations which, together, round out our program of progress at the Temple. Truly, from the little acorn doth the mighty oak tree grow. In the year 1967 the Grand Lodge of Ohio directed that each of its subordinate lodges have its history written, a copy of which was to be forwarded to the Grand Secretary, W. Bro. Raymond A. Castator was Worshipful Master of Washington Lodge No. 17 in 1967, and he appointed W. Bro. William E. Lakeman to write these annals of our lodge. It was also at the instigation of W. Bro. Castator that this booklet was printed for distribution to our membership. Our lodge is fortunate in having preserved the minutes of every meeting it ever held.